Note: Click the High Definition Button and Full Screen Button, to see these videos at the highest quality level. If you haven’t read my Complete HTML W3C Tutorial, you should do that first. 3. 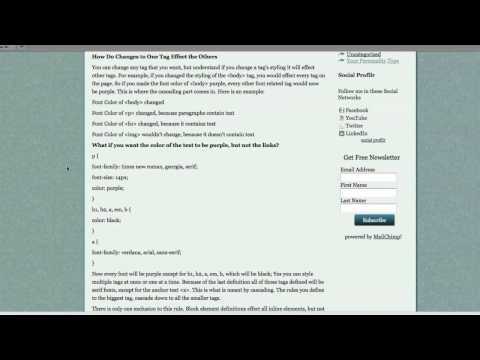 I go over how changing one tag, effects the other tags. 4. Then I go over CSS classes. 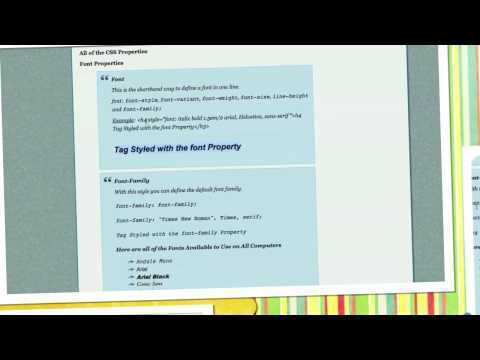 In this video, I describe in detail every single property you can use to style text including: font, font-family, font-size, font-weight, font-style, font-varient, line-height, letter-spacing, word-spacing, text-align, text-decoration, text-indent-text-transform, vertical-align, color, and background-color. In this video, I show you how to edit the properties of your background, tables, lists and even cursors. At the end of this video, you will know every property available in Cascading Style Sheets. Some of the properties taught include: background, background-image, background-repeat, background-position, background-attachment, border-collapse, border-spacing, caption-side, and cursor. In this video, I’ll show you the box element. Everything is considered a box in CSS, so they are a good thing to learn about. I’ll explain the differnce between padding and margins. I’ll show you every single property available for box elements and how to edit them. Also, I’ll provide you with the complete HTML and CSS code behind three differently styled box elements. Box element analysis is the perfect way to start understanding div elements. In this video, you’ll be introduced to div elements. I’ll give you the code behind many styled divs. Show you how to create 2 and 3 column CSS layouts. And how to create and layout your whole page. 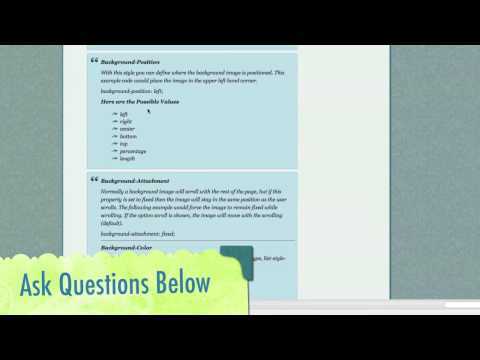 If you understand the information found in this video you will be well on your way to designing your own WordPress Themes. With good use of organization, you will find that you can create extremely complicated looking web templates. 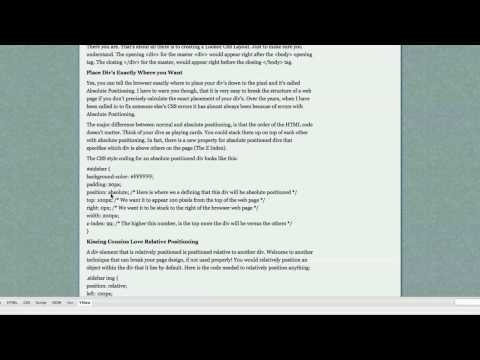 Get excited because you are one video away from being a Cascading Style Sheet Guru! 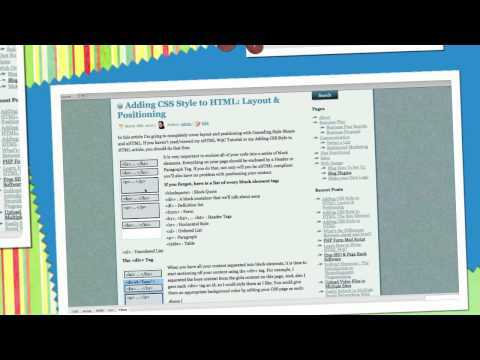 In this video, I describe the difference between liquid and fixed CSS layouts. I then explain how to use relative, fixed and absolute positioned CSS layouts. 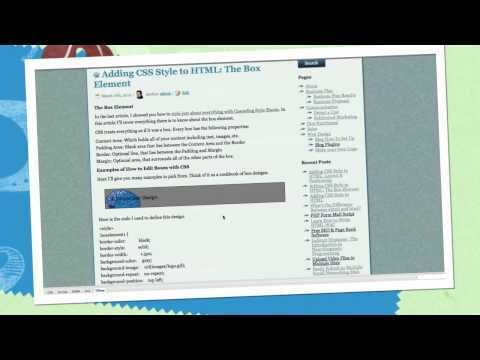 You will be a CSS Expert after this video. If you have any questions leave them below in the comments section. Yes indeed! I’ve been posting everyday for a good while now. If you want me to cover something specific just ask. When I want to solve a problem, I read the top 10 to 15 books on the subject and then create a solution. Is there a subject you would like to see covered? wow! thanks for these video tutorials! its really a big help to have a guide in learning the css codes.. they are pretty much confusing! what is em? what does it stand for? Like px stands for pixel, what about em itself? An em equals the current document font size. So if the font size is 12 pts, 1 em equals 12 pts. A point is equal to 1/72nd of an inch. Web designers are starting to use em over px as of late because they size better depending on the screen size. Remember in the past pretty much everyone had the same size monitor. Many developers are now starting to chose % over em though. The reason why is because % resizes with better results than em. Thanks for bringing this up. I might do an article on this topic to elaborate further. Thank you 🙂 There isn’t a tag called box, but instead when we say an element is a box element we mean that it has margins, borders, and padding. A div has these and so it is considered a box element. Does that clear everything up? Thank you, I appreciate what you’ve done. I’ve learned a great deal with your videos. It definitely made the learning curve manageable. How to create different style definitions for different media without creating multiple copies of document ? You are as awesome as anything can be ! !